I'm not really a good cook. I could be if I wanted to be but most of the time, when it comes to cooking, I do the bare minimum. Me and the kitchen, we are acquaintances but not really life long friends, if you know what I mean. However, every once in awhile I get the urge to reacquaint myself with that place and when that happens I can usually produce some pretty yummy food. 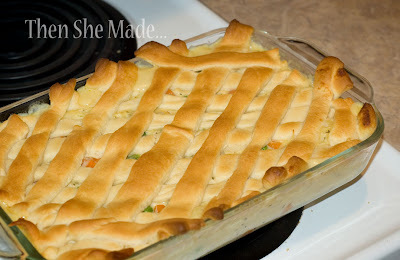 For instance, my Chicken Pot Pie. It's a family favorite. It's something that all 5 of us will eat, and usually want more of. So, since I made it this week, I thought I'd share this successful recipe. 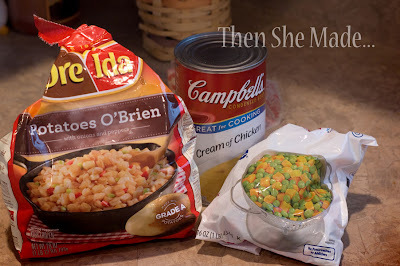 You know, just in case you are like me and occasionally want to make something yummy. *** - I will usually double or triple the filling. This makes a really great meal to take to a friend so having extra is always a great idea. 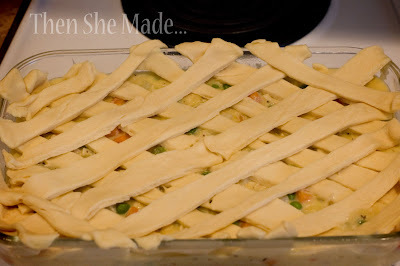 Plus, I like my pot pies with more filling than bread or crust so doubling it helps with that. Take out your butter, Thyme and a medium to large sauce pan. 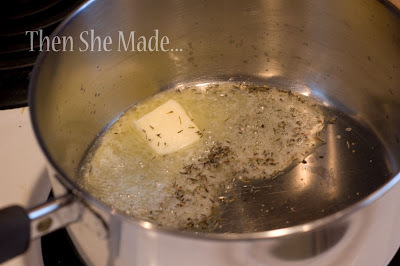 Melt your butter and add in your thyme. Let them blend together for just a few minutes. Be careful not to leave it too long as you don't want to burn the butter. 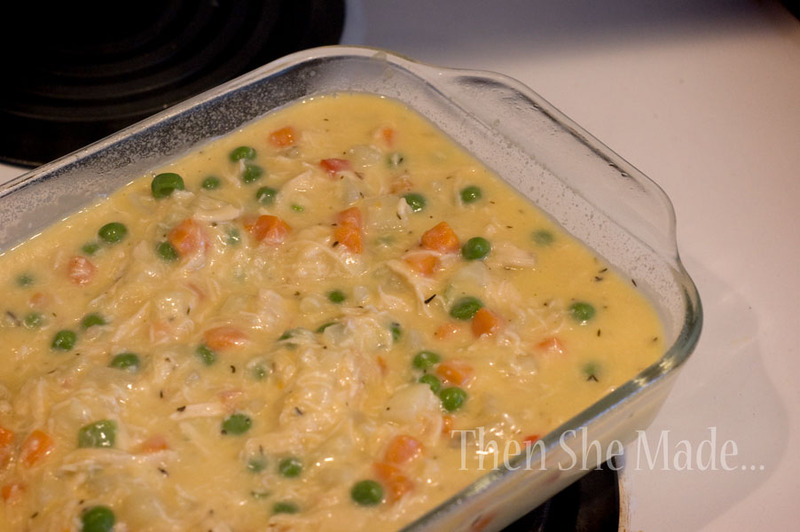 Next add the potatoes, cream soup, peas and carrots, milk and chicken. It will be thick. 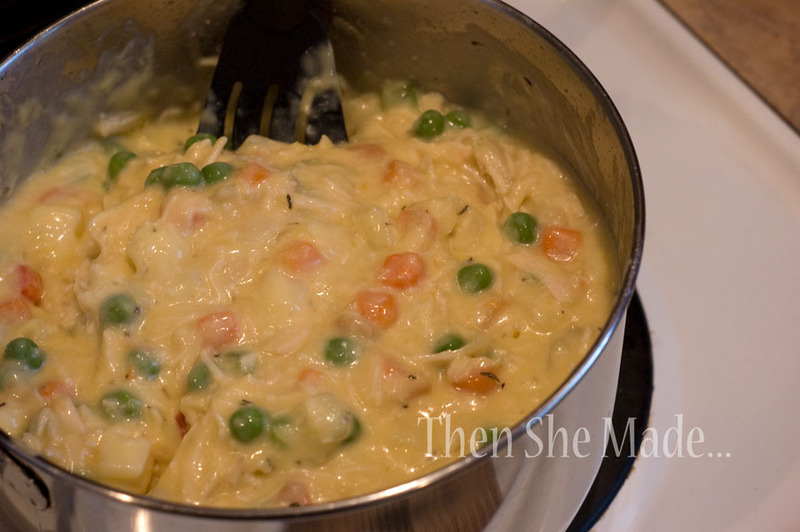 Sometimes I will add in a little bit more milk but don't add too much, you don't want it runny. Heat over medium-high heat until it comes to a boil. Continue cooking until potatoes are tender. Stir often to keep it from sticking to the bottom of the pan. 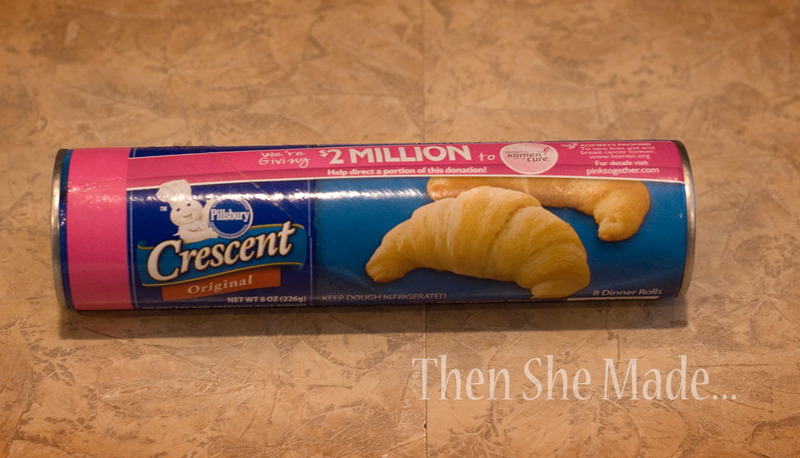 While the filling is cooking, grab your crescent rolls. 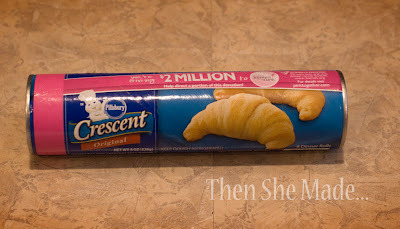 On a clean surface, roll out your crescent dough. Take the triangle sections and push the perforated lines together so that you have two long rectangles like shown in the picture on the left. Then, using a sharp knife, cut the dough into long strips. Once the filling is completely heated and potatoes are tender, pour the mixture into a 9x13 baking pan. Take strips of crescent dough and layer them on top of the filling mixture. I usually lay them out so that it looks like a lattice design but you can really do what ever with your design. Next, place your lovely dish in a 400 degree, preheated oven and bake for 11 to 13 minutes or until the crescent roll dough is lighted browned. Let it sit for a few minutes and then enjoy! - Sometimes I will buy a rotisserie chicken that is already cooked and just cube the chicken and use it. It's quick and easy but does add to the cost. - Or, place 3 or 4 chicken breast in the crockpot with some chicken broth and a small can of green chiles. Cook on high for 4 hours and then cube, or shred it, and then add to the filling mixture. This will usually give you more chicken than you need for the pie so save the rest and use it for Chicken tacos or enchiladas the next day. This looks so yummy. Thanks for the tip about cooking the chicken in the crockpot. That's a very easy idea! I know what I am making for Sunday dinner! Thanks Amy. I'm about to put this in the oven. I doubled the potatoes and milk, needed two cans of Cream of something, but only had one mushroom one, so I added some Mayo and chicken broth instead. I only had a can of turkey so it's little on meat, then used the turkey juice too. I shouldin't of opened the chicken broth. So we'll see how this turns out. I'll keep you posted. I made this yesterday.. SO GOOD!!! and SO PRETTY!! I changed just a few things, but the concept was the same. I made crock pot chicken as noted in your tips, and used the broth from that to make the gravy instead of the cream of chicken soup. 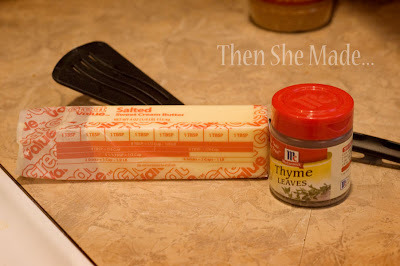 I's also not fond of Thyme, so instead of Thyme, I used Poultry seasoning.. everything else was the same. DELISH!! Definitely adding to my "make again" list!! Thanks SO MUCH! My wife tonight for dinner, it was Awesome!! !